QWOP Charity Run (via NYU’s Play On) to Support Child’s Play Tonight! UPDATE: I Managed to run 35.8 meters (* $5.45 pledged) to raise $195.11 for charity!! Hey, everyone! The NYU Game Center is currently hosting an amazing 24-hour videogame playing marathon, called “Play On” to support the incredible charity, Child’s Play. The whole thing is streaming and you can donate at any time here. 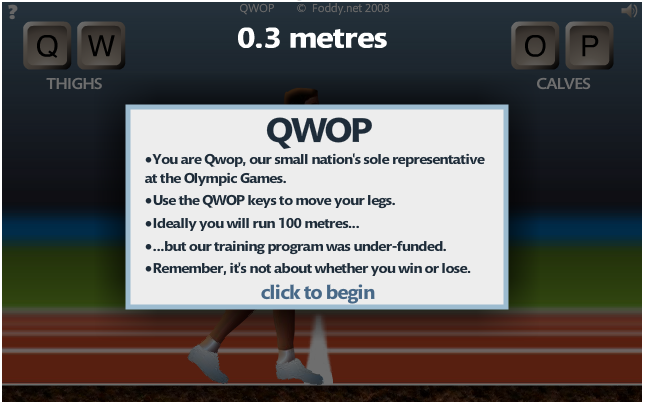 For my small, silly addition to this event, I’m going to do a QWOP marathon charity run. What is QWOP? Well it’s an innovative game by Bennet Foddy where you control a runner’s individual calves and thighs to try and make him run as far as possible without falling. You can play it free in-browser here to get a sense of it and it’s extreme difficulty. At 6:30pm on Friday September 2nd (Today). 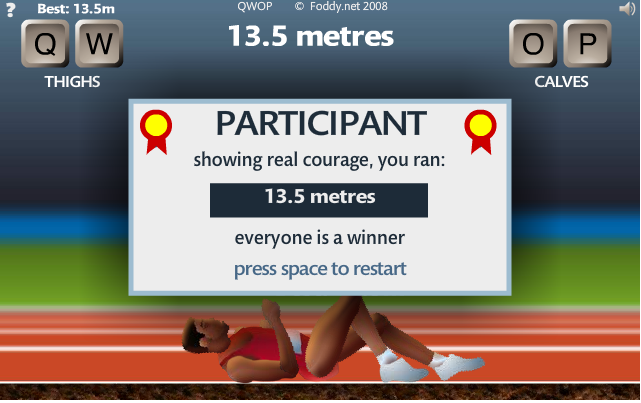 I’m going to play QWOP for one hour straight. I’m going to pledge to donate 50¢ for every meter in my longest run of the hour. Hopefully it will be live streamed via the site. Now, I’ve only played the game for probably about 20 minutes total in my life, and my longest run is 13.5 meters. I’m hoping that with an hour straight tomorrow, I can beat that by at least a decent amount. I’m encouraging anyone else who wants to donate to the charity to pledge their own amount per meter of my longest run. Even if it’s just 5¢/meter, that’d be great. Of course, you could bypass all of this and just donate right now. The pledging is totally self-policed. You don’t have to commit to anything, it’s just a fun way of donating that I’m hoping will get some people involved. So you can make your donation after the hour (around 7:30pm) based on my longest run if you’d like to participate. Scroll down and comment in the Leave a Reply box on this page with your pledge and hopefully I can build up some support under such short notice. UPDATE: $5.45 / meter total currently pledged. Abbe: 75¢/meter….I’m assuming you’ll just tell me how to pays me money when yer done. We pledge $1.00 per meter.